As a leading financial institution in Asia, UOB is focused on creating sustainable value for our stakeholders and aligning our long-term business strategies with their interests. As we continue to deepen our presence across the region, we seek to address the environmental, social and governance (ESG) risks and effects of our operations in a manner consistent with our values. This is also in line with our commitment to help ensure a safe, secure and trusted banking system. The Board is committed to building on the Bank’s rich heritage to continue creating long-term value for all its stakeholders. Integral to the business direction UOB takes is its sustainability strategy. In formulating this strategy, the Board considered the factors which contribute to the sustainable growth of the Bank. As part of the process, the Bank undertook detailed gathering and assessment of data and insights from across the organisation and from its external stakeholders. Together with Management, the Board identified opportunities relevant to the long-term success of the Bank and determined the material ESG risks to be managed. Through its Committees, the Board oversees the management and monitoring of these factors to ensure that the Bank is responding effectively to developments in the market and in view of its stakeholders’ expectations. The Board and Management are supported in this regard by the Bank’s dedicated ESG Committee comprising senior executives from functions across the organisation. The framework of UOB’s sustainability reporting is in line with the SGX Sustainability Reporting Guide and the Global Reporting Initiative (GRI) Standards. We are pleased to state that UOB’s Annual Report 2016 won the Best Inaugural Sustainability Report (Mainboard) Award at the first Singapore Sustainability Reporting Awards. The Bank’s values of Honour, Enterprise, Unity and Commitment underpin UOB’s sustainability strategy. These will continue to guide its people, policies and processes to ensure the long-term interests of its stakeholders are met and the performance of UOB sustained. When making business decisions and developing our products and services, we consider our stakeholders’ expectations in appreciation of what is material to them. As part of our commitment to sustainable and responsible growth, we also seek to identify, to assess and to manage ESG risks, challenges, impact and opportunities. We stepped up our non-financial reporting to include sustainability reporting in our Annual Report 2016 to give our stakeholders insight into the Bank’s approach to sustainability and we continued to build on our efforts in 2017. During the year, we refined our sustainability strategy after extensive discussions and workshops with teams from across the Bank which were facilitated by an external consultant. Our deliberations considered macro sustainability trends, including responsible banking, the Singapore Exchange’s (SGX) reporting requirements, the United Nations’ (UN) Sustainable Development Goals (SDGs), the Paris Climate Agreement and the recommendations by the Task Force on Climate-related Financial Disclosures. 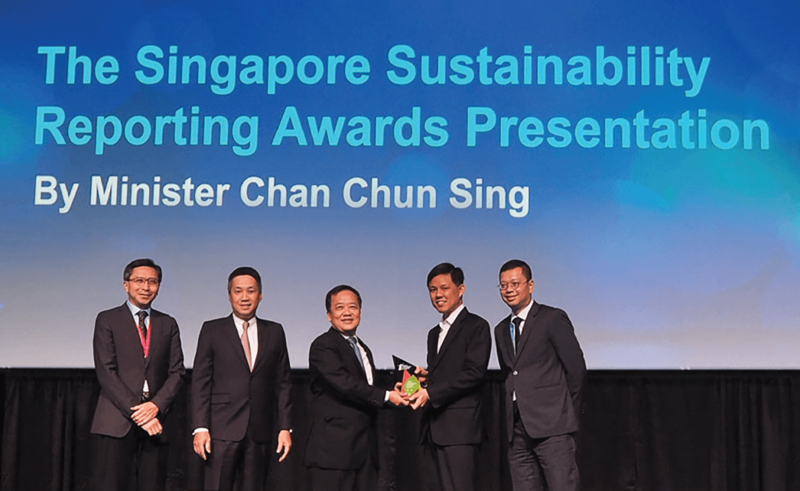 Our Group Chief Financial Officer Mr Lee Wai Fai (centre) receiving from Mr Chan Chun Sing, Minister in the Prime Minister’s Office, the Best Inaugural Sustainability Report (Mainboard) Award at The Singapore Sustainability Reporting Awards 2017 organised by the Singapore Institute of Directors. We received the award in recognition of the quality of our sustainability disclosure in our Annual Report 2016. Our sustainability strategy mirrors our business approach of balancing growth with stability. It takes into account the influence and impact our decisions and actions might have on the industry, society and the environment. It was also formulated to ensure we remain economically relevant through managing ESG risks and opportunities practically and in line with market realities. To help our programmes and initiatives take root and gain ground, we have ensured alignment with the ESG regulatory policies and guidelines in each of our key markets. Just as our business strategy hinges on doing what is right for our customers, our sustainability strategy informs our engagement with our stakeholders and how we can help them in their own practices for positive outcomes in the long run. The pillars of our sustainability strategy arise from our fundamental strengths and are rooted in our values. They reflect the Bank’s expertise, the responsibilities we hold and the role we can play for the long-term benefit of our key stakeholders. Each of the pillars determines a set of objectives which we strive to achieve to ensure that we implement our strategy with clear plans and purpose. In sustaining growth responsibly, we incorporate sustainability risk elements in our approach to risk management. This includes integrating ESG considerations into our credit evaluation and approval processes. Beyond financing, we are increasing impact investing in our portfolio allocation. For our customers, we help develop and provide sustainable solutions that will assist them in making a difference. We also align our sustainable development efforts with the UN’s SDGs. With customers as our focal point, we ensure that Fair Dealing principles are entrenched in all aspects of our relationship with them. Keeping their best interests in mind, we harness technology and use data to make banking simpler, smarter, safer and more intuitive for them. By doing so, we aim to make banking more accessible and inclusive in the communities in which we operate. Standing by our customers also means that we must protect their data and privacy, and maintain the security and robustness of our systems. Our colleagues enable us to ensure the best outcome for our customers, our business and our community. Hence we are focused on developing professionals of principle – high-performing teams and individuals who are guided by our values. We embrace diverse abilities and strengths as these enhance our capabilities and enrich our competitiveness. We equip our colleagues to take on the challenges of tomorrow even as we care for their welfare and work-life harmony today. We also foster a sense of belonging by encouraging employee volunteerism and increasing their engagement and satisfaction. We believe that as a responsible financial services provider, we have a role to play in strengthening the fabric of society by supporting the spirit of enterprise across all stages of business growth and protecting the financial system for its full benefits to be felt. We remain steadfast in our commitment to promote the development of art, children and education, and to help protect the environment – all aimed at contributing to a strong and sustainable future for the wider community. As we focus on creating sustainable value for our stakeholders, we assess the ESG matters relevant to the banking industry, the implications for the Bank and the insights provided by our internal and external stakeholders. Our priorities include building an ecosystem where enterprise and innovation can thrive, enabling simpler and safer banking for all through the use of technology, supporting corporate clients in managing their businesses locally and as they expand across borders, and helping retail customers plan, save, spend and invest wisely. We believe that security is paramount given the rapid development of technologies and disruptive business models, and the changing regulatory landscape. There is also growing sophistication of financial crime and cyber threats. In safeguarding the interests of our stakeholders, we maintain the robustness of our systems and processes and uphold our role in ensuring a safe, secure and trusted banking system. Our investments are also directed to nurturing our colleagues, embracing diversity and inclusiveness, promoting trade and industry, focusing on responsible financing, encouraging entrepreneurship and making our financial services accessible to all sections of society. We support the development of the communities in which we operate and play our part in managing our environmental impact. Cybersecurity, fraud prevention and anti-money laundering. In line with our own expectations of strong corporate governance and high ethical standards, we included ‘Anti-corruption’ as a material ESG factor in 2017. The 15 factors are aligned with our sustainability pillars. A summary of our material ESG factors and their corresponding GRI Standards topics and boundaries are presented in the following table. In 2017, the Bank reviewed and updated our sustainability governance structure to include the Senior Management-level Risk and Capital Committee and the reconstituted ESG Strategy Group to ensure that sustainability factors were considered in all aspects of our operations. The ESG Strategy Group, comprising representatives from various business and support functions, reviewed material ESG factors, collated and assessed data, goals and targets and identified sustainability risks and opportunities with the guidance of the Risk and Capital Committee. The Management Executive Committee (MEC), which comprises the Group Chief Executive Officer, Group Chief Financial Officer, Group Chief Risk Officer, Head of Group Technology and Operations, Head of Group Retail, Head of Group Wholesale Banking and the Head of Global Markets, reviews and determines the material ESG factors and their scope. The MEC evaluates key performance indicators, reviews long-term business and organisational goals and provides the strategic direction for the Bank’s sustainability practices. Chaired by an independent director, the Strategy Committee has been delegated by the Board of Directors with general oversight of the Board’s attention to the sustainability agenda. An ESG Committee was set up in early 2018 to replace the ESG Strategy Group. The ESG Committee reports directly to the Management Executive Committee on the Bank’s sustainability matters. Our sustainability reporting is in accordance with the GRI Standards: Core option and selected indicators from the GRI G4 Financial Services Sector Disclosures paper. It also complies with the SGX-Securities Trading Listing Rules (711A and 711B) and the SGX Sustainability Reporting Guide. The GRI Content Index, which indicates the location of the relevant disclosures, is on pages 267 to 271 of this report. In defining our reporting content, we have applied the GRI Standards (GRI 101: Foundation 2016). We have also determined the reporting content on the basis of materiality assessment and stakeholders’ interests, expectations and concerns. In that regard, we have considered the broader sustainability context in which we operate our business and we have reported our relevant performance for the past three years for the identified material ESG factors unless noted otherwise. To ensure reporting quality, we have observed the principles of accuracy, balance, clarity, comparability, reliability and timeliness to help our stakeholders assess our overall ESG performance. The ESG data and information provided have not been verified by an independent third party. We have relied on internal data monitoring and verification to ensure accuracy, while our external sustainability consultant reviewed the data and information, verified samples of data and conducted interviews to ascertain accuracy.